We arrived back in Portland last night. I'm sitting outside on my back porch again, and it's COLD. Well, it's probably around 65, but after being in a constantly-above-80-degrees environment, this gray weather feels frigid. We spent our entire Sunday morning at Red Mountain. It feels like a church that has a lot of potential. Much of the community has been part of the church for awhile, but there is an increasing need for spiritual depth and Biblical understanding. The people were so friendly and inviting to us! 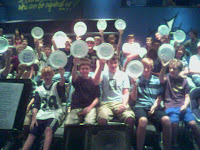 I had the opportunity to teach the junior high students, and an entire group of guys made paper-plate signs to cheer me on! I had to take a picture with my cell phone camera. I got to interact with a lot of the students, and they were very friendly, and even excited that we were there. I was told at least twice that I "rocked their socks off" that morning. We had an impromptu Q&A time, where I shared my most embarrassing moment in life. I won't go into details about that story. Let's just say it involves bodily fluids in public places at a time in life where that just shouldn't happen. After the services, Katie and I had a lunch meeting with the elders of Red Mountain. They were extremely friendly and approachable guys with insight and passion for ministry. It was refreshing to hear their questions--even though some of them were really tough!--and interact with them. I'll be honest, I've never interacted with an elder-board where I felt as comfortable and valued as I did with these men. Even though I was "on the spot" and they were asking me some tough questions, it wasn't intimidating. The whole experience with Red Mountain was refreshing. 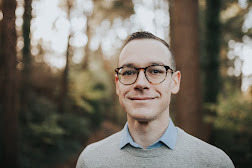 It was great to see a church that was vibrant, moving in a healthy direction, and had a leadership team built on trust and loving relationships. We also ate some super great food from some nearby restaurant called Red, White, and Brew. If we end up in Arizona, I will probably frequent this place often. It's like the Mesa version of Pastini here in Portland. Pastini is still my favorite Portland restaurant of all time. I highly recommend the baked ziti with Italian sausage. We'll have some huge decisions to make in the next few days. As soon as a decision is officially made, it'll probably end up on the blog! Great to hear it went so well! You are awesome! That is really funny that they made plates to CHEER you on!! That is great! Way to go buddy!